I’m going to run out of voxel-based titles and puns real soon. Until then, have some more flying cubes! The sparseness factor influences render time a lot, since there is no efficient skipping of empty space inside the voxel grid. So denser grids render at interactive framerates (>30 fps), because the rays terminate early. Grids with a high sparseness render at abysymal framerates (< 4 fps). I expected this performance hit, but didn’t think it would be this big. Just shows why we need a hierarchical, decent acceleration structure in place. Remember, this is a ray tracing technique – I’m not rasterizing found voxels here, which some hybrid techniques do – this is per pixel. 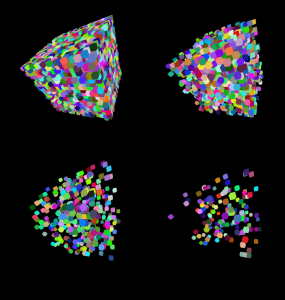 All results are rendered with a 20x20x20 (8000 voxels) datagrid, varying sparseness at a resolution of 1200×1200, and were downscaled 60% to keep file size acceptable. 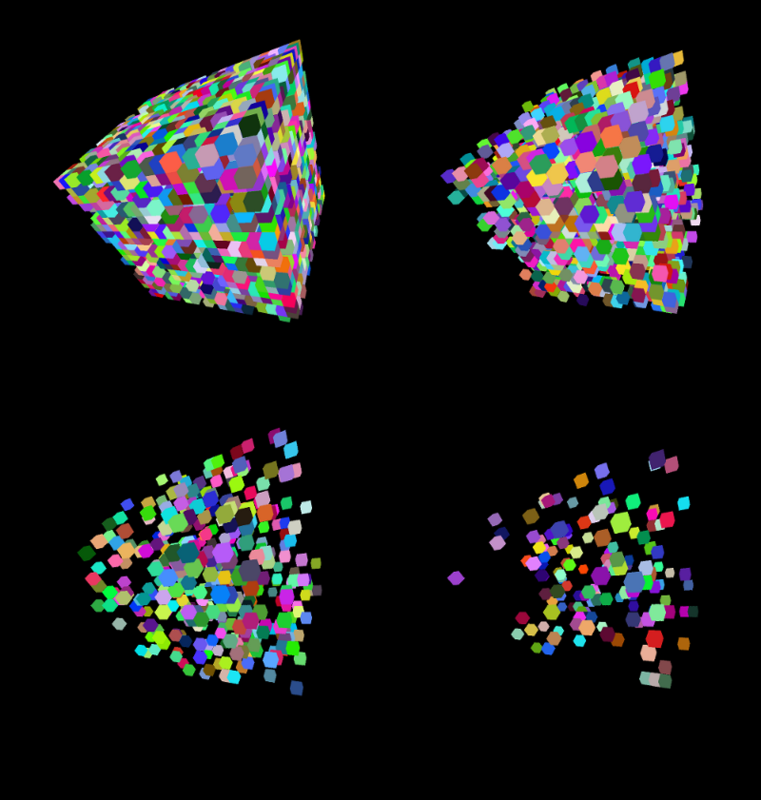 Maybe some more parametrisations to work with (cone, sphere, …), or trying to tackle a real-world voxel model. I am happy to award you the “Most interesting uses of cubes to date”. Wondering when we can expect opacity and reflection of rays. Opacity is the next step – it’s a fairly straightforward algorithm (accumulating color until it’s too dense to continue meaningfully), but I need a stable method to get me all the voxels my ray crosses without having to march through the grid (like I do now). That’s what http://en.wikipedia.org/wiki/Bresenham%27s_line_algorithm (DDA) does.